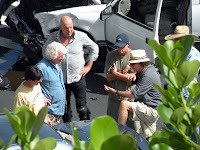 Over the weekend the LOST cast and crew filmed a car crash scene for Episode 5×06 The Life and Death of Jeremy Bentham. 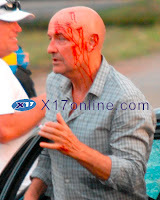 We posted an image of a bloodied Locke and the blue sedan that is involved in the crash. However, today we have another set report and more images of the shoot. As we previously reported some of the vehicles nearby had Oregon plates and today’s report confirms that they were indeed involved with crash and confirms that 3 vehicles are involved in crash including a white SUV. Thanks to Tim Ryan for this report and images and also X17 for a couple of the images of Locke. ABC’s LOST spent Saturday in Kakaako near downtown Honolulu to film a three-car Locke (Terry O’Quinn) oriented crash scene at South and Pohukaina streets which was closed to traffic and pedestrians most of the morning and afternoon…LOST Special Effects coordinator Archie Ahuna coordinated the crash and rigged the vehicles that included a Mercury Marquis, SUV, and and old Toyota Camry. Charlie Long’s Private Security team was out in force doing a yeoman job in keeping the curious public at bay and having to follow some production exec’s mandate to prevent photos from being taken despite photographers being on public property. (More about that in another column. )…Two special effects scenes were shot, including the crash and later a near roll over. 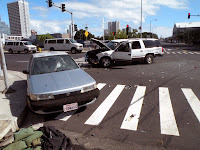 Three Mercury Marquis were used including a rental which remained unscathed and two other used ones that were deliberately crashed in the stunt…In the scenes the cars had Oregon license plates…The production used three cameras to get the show – one of South street, on Pohukaina, and one on the 8th floor of the Circuit Court parking building. Lost top execs were out in force including producers Jack Bender and Jean Higgins…O’Quinn filmed some morning scenes but his stunt double took over for the crash. This entry was posted in Uncategorized and tagged Filming Updates, Locke, Set Photos, The Life and Death of Jeremy Bentham. Bookmark the permalink.